The Penn State Board of Trustees Committee on Finance, Business and Capital Planning today (Feb. 25) approved the first phase of a long-term initiative to renovate all of East and Pollock residence halls on the University Park campus, with construction of two new residence halls and renovations to Stuart Hall slated to begin in March. The projects will be presented to the full board for a vote on Friday (Feb. 26). Both projects have an estimated completion date of July 2017, and the addition of the new residence halls is expected to accommodate the need for space created by renovation to Pollock Halls and the remaining East Halls residential complex. There are currently 14 residence halls in East Halls and nine in Pollock Halls. 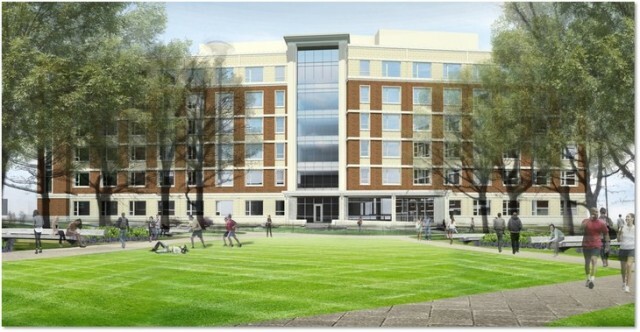 The first phase of the East Halls project includes a new residence hall with 336 beds and renovation of Stuart Hall. East Halls is home to 3,825 students – primarily first-year students -- is bounded by Bigler and Curtain roads, and East Park Avenue on the west. The new residence hall will feature double rooms – the type with the highest demand – along with shared private bathrooms, an apartment for a Residence Life professional, lounge and study space and movable furniture. The design allows for natural daylight in the core of the building. The committee recommends approval of the final plans by Clayco of St. Louis, Missouri, and the authorization of $65.1 million for the project. Upgrades to Stuart Hall will include installation of air conditioning and private bathrooms, improved student social and service spaces, and movable student room furniture. The bed count will remain the same – at 273 beds. A first-floor apartment will be built for a Residence Life professional. Site improvements at East Halls will consist of updated recreational spaces and landscaping, as well as improved parking and pedestrian walkways. The project scope also includes providing utility connections for the Findlay Dining Commons and the north half of East Halls. The committee also recommended the approval of final plans for a new residence hall in the center of the North Halls complex as designed by Irwin and Leighton of King of Prussia, at a cost of $33.5 million. The new building will house 310 beds, most in double rooms, and private bathrooms and air conditioning.